With the fire lit and the mowthgar in a panicked charge the party takes the opportunity to duck and run. Kilminster Barrackbomb is eager to charge into the fray and save his brethren from the upcoming sacrifice. But the odds are overwhelming and reason wins out over blind heroism. Retreating to the black pools the team faces down a small contingent of orc scouts rapidly running them down. Victorious, they continue their mad flight, lead now by the old man called Argus Emir (no relation to our dear Argus the barbarian). But the other Argus, the barbarian, passes out as he nears the glowing orange globs lurking above the water. The orange blight is still upon him! Argus the elder leads them through a shaft that slopes steeply upward while Argus the younger is carried. Killminster and the dwarves collapse the roof to discourage orcs from following. The trail leads to the surface and back to the wind and cold. The party discusses their plan. The sacrifice, somehow related to the Shrine of Worms, must be stopped. A dwarven stronghold is nearby – Northpoint Stronghold, commanded by Krakster Farznickle. Hulktall, Bruiser, Killminster, and the few dwarves they brought out from captivity all head to the stronghold while Frothgar accompanies the other captives along with Sparru, Argus, Skat, Quilliam, and Gul’Daryh to the village of Argus Emir. The dwarf Silverchain does not accompany the other dwarves. She is tired of the cold and wishes to find a warm place to rest. On the walk to Frostmyr she reveals something about the Shrine of Worms…an old tale she was told by her mother. The Shrine was built deep in the earth beneath another shrine on the surface…one dedicated to an ancient and forgotten goddess. No one knows how they were destroyed but both have been dormant for a thousand years. The village of Frostmyr is not far and the crew makes it before dark. Low round houses covered in ice and snow reveal themselves by spindly trails of chimney smoke. The village common house, owned by Argus Emir and Edda, welcomes the party heartily with hot bowls of gariboo and ice turtle soup and mugs of stout ale. Villagers come to meet with their lost friends. Old Edda and Argus Emir suggest that the orange plague that Sparruu and Argus suffer must be attended immediately for they have heard of such things before. Such an orange plague took poor Edda’s husband years ago. Argus leads them to the dwelling of a strange old hermit outside of town who he calls Blart. They meet him atop a hill by his house and he quickly reveals himself to be eccentric and magical. The heroes take their leave of Blart’s small house with the intention of returning the next day. The team makes short work of the ten orcs that have come to investigate the noise behind them. Between Sparruu’s Bedazzling, Gul’Daryh’s arrows, and the axes of Frothgar and Argus the enemies are put down. One of them was bearing a large battle horn carved from the horn of a garilou…but he never got the chance to blow it. It seems no other enemies heard the clash so the party moves on through the tunnel, heading north toward the slavers and, ostensibly, the meetpoint. Stealth is dealt…a small room full of common supplies is guarded by an iron portcullis. In it are spears, shields, sacks of grains, and boxes of other supplies. Further down the tunnel is a larger chamber, also gated, full of snarling mowthgar! These short, hairy beasts begin to sniff and chomp. A spell of silence is woven to keep them quiet. Across the hall is a stairway leading down flanked by torches and past it the stealthy Skat finds a large opening, guarded by a portcullis, holding ten frail captives…dwarves, humans, even a halfling. Apparently these are the slaves not worth sacrificing. With the help of the powerful Argus the gate is raised and the captives freed. Meanwhile two cyclopean orcs make their way up the stairs, apparently on innocuous business. With the team lying ready the orcs don’t stand a chance. Skat makes his way down the stairs to check out the area. He sees a door, closed. In his hurry he neglects to see that the floor is trapped in front of the doors…spikes jutting up, barely missing key vitals! Hurt but not seriously he makes his way back to the top to quickly inform the others. Argus, taking up a dead orc, rushes down the stairs to throw the corpse upon the spikes…hopefully fooling any guards into thinking their own had sprung the trap. But alas…the doors open as he approaches. He stands, dead orc in hand, with several guards staring at him. Caught red-handed he throws the body down the steps, knocking the guards to the floor. Blood from the corpse had dripped down and his footing gives way. Slipping, he tumbles down the steps. Having survived the orange goo the party searches the cavern and discovers several trinkets lying about, hidden under rocks and in crevices. Some of these, Quilliam surmises, appear to be of a magical nature. Could it be that the orange goo eats everything except that which is magical? Perhaps. The crew continues forward into a larger cavern where foul orcs have made camp in the past. Sadly they discover the bodies of three dwarves…killed in the slave march for being slow or wounded. Frothgar gives them last rites and prepares the bodies to be transported so they may be laid to rest or burned respectfully at a later time. The room opens into a different cavern, like a smaller highway merging into a larger one. Camp is made. After about 5 hours of rest they are awoken by Quilliam and Brickwallow…a large group approaches from the larger tunnel outside the cavern. Orcs! Perhaps another slaver group. Sparruu and Argus both start to notice their hands are burning and glowing slightly orange…what evil lurks in their veins from the orange goo that once got inside them? Skat, carrying a silenced stone, runs behind the orc group and spies. 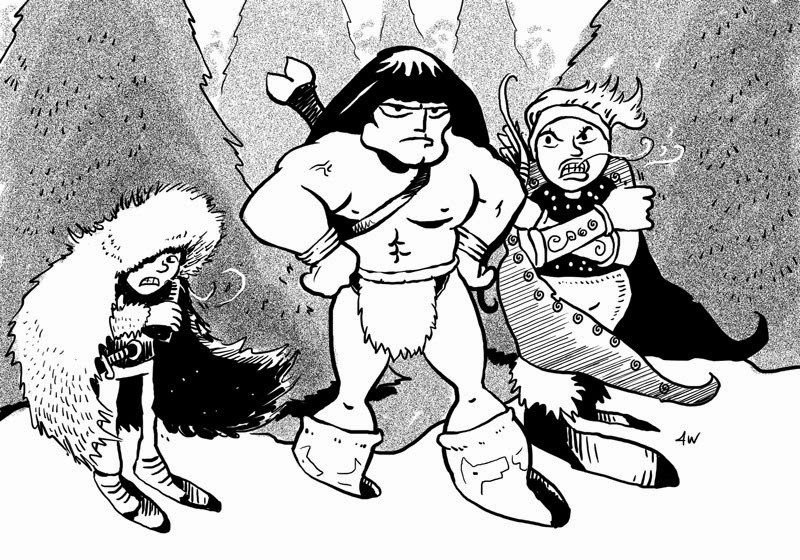 He learns they are indeed leading hostages…dwarves, humans, and others. They are heading to the meetpoint to regroup with Ur-Kak the Swine. There is mention again of “the damned elf”. Plans are discussed. Attack the orcs directly? Sneak up and pick them off somehow? Push them into the deep pool that they know will be coming up soon? In the end they trail the orcs as closely as possible. When the pool is reached the orcs slow down. One of them, on a dare, sticks a toe in the water…and is immediately pulled in. The great mouthy beast the party encountered before seems to travel from pool to pool…or there are many of them. The orcs pass the pool. The party starts to move past, the orange glow of goo lighting the dark pool. A single stalk with what looks like an eye pokes up…watching them. Sparruu and Argus feel the orange in their hands burn and glow hotter. As they skirt past the large pool they come upon a smaller pool. Suddenly the cave gobbler strikes, bursting out of the black water and gnashing its huge mouth at Argus. The barbarian’s keen reflexes save him and the fight is on. Slashes, hacks, and tail swishing! Urfnozzle Doorbreaker is grabbed by the whipping tail and thrown into the depths of the pool. The heroes bash away at the rotund monster and Brickwallow Stormshot deals a telling blow, sinking into the pool along with the creature! My new module, Winds of the Ice Forest, seems to be completely written and is now being laid out. This is a sample piece of the art. Gotta work out the cover, then it should be ready for publication shortly thereafter. This is a Labyrinth Lord module for 1st-3rd level PCs. I ran elements of the adventure for two groups and had a great time with it. The module is a bit of a lost-in-a-maze affair with lots of random rolls for encounters, though you can easily pre-determine which ones you want to use. I designed it as a drop-in adventure rather than giving it a huge story. I tend to prefer simple modules myself that allow for a lot of GM fiat.